"This dessert is absolutely gorgeous! It is easy to make, and simply heaven! Use different fruit combinations for variety - strawberries and blueberries, kiwi and raspberries, nectarines and bananas - anything goes." Preheat oven to 475 degrees F (245 degrees C). Cover a baking sheet with foil, and spray lightly with cooking spray. In a large bowl, beat the egg whites to form stiff peaks. Add white sugar slowly, and continue beating. When egg whites are very stiff, add vinegar and boiling water. Continue beating until glossy surface is beginning to fade, and mixture is very stiff. Pile meringue onto prepared baking sheet. Shape into a circle 1 1/2 inches thick. Form a slight dip in the center, and make the sides slightly higher. Place meringue in the oven, shut the door, and turn the heat off. Leave in the oven for one hour. Check the texture of the meringue; it should be hard with no soft spots. If soft in the center, heat oven to 250 degrees F (120 degrees C). Place meringue back into the oven, and turn off the heat. Cool when done. Transfer onto a serving platter. Whip the cream until just stiff. Beat in vanilla and confectioners' sugar. Pile the whipped cream onto the meringue. 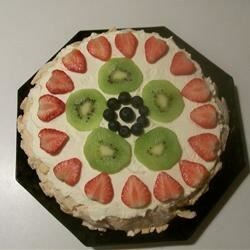 Arrange the fruit on top of the whipped cream, and serve. This came out beautifully! Love it with strawberries and kiwis. Will make this again for sure. it is the best my kids even love it!